The Galilee earthquake of 363 was a pair of severe earthquakes that shook the Galilee and nearby regions on May 18 and 19. The maximum perceived intensity for the events was estimated to be VII (Very strong) on the Medvedev–Sponheuer–Karnik scale. The earthquakes occurred on the portion of the Dead Sea Transform (DST) fault system between the Dead Sea and the Gulf of Aqaba. Sepphoris, north-northwest of Nazareth, was severely damaged. Nabratein and the Nabratein synagogue (northeast of Safed) were destroyed. 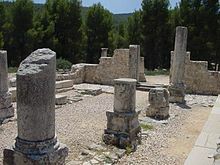 The earthquake may have been responsible for the failure of the plan to rebuild the Temple in Jerusalem with the permission of the Emperor Julian. Petra, in what is now Jordan, was fatally damaged. ^ Ferry, Matthieu; Meghraoui, Mustapha; Abou Karaki, Najib; Al-Taj, Masdouq; Khalil, Lutfi (2011). "Episodic behavior of the Jordan Valley section of the Dead Sea fault inferred from a 14-ka-long integrated catalog of large earthquakes". Bulletin of the Seismological Society of America. Seismological Society of America. 101 (1): 48. Bibcode:2011BuSSA.101...39F. doi:10.1785/0120100097. ^ Safrai, Zeev (1998). Missing Century: Palestine in the Fifth Century: Growth and Decline. Peeters Publishers. pp. 86–7. ISBN 978-9068319859. ^ Meyers, Eric M.; Strange, James F.; Meyers, Carol L. (Spring 1982). "Second Preliminary Report on the 1981 Excavations at en-Nabratein, Israel". Bulletin of the American Schools of Oriental Research. American Schools of Oriental Research (246): 35–54. JSTOR 1356586. ^ "Jewish History Sourcebook: Julian and the Jews 361–363 CE". Fordham University. This page was last edited on 4 March 2019, at 10:17 (UTC).